SCANPH attended the grand opening of Clifford Beers Housing’s King 1101 Apartments on January 18, 2019. 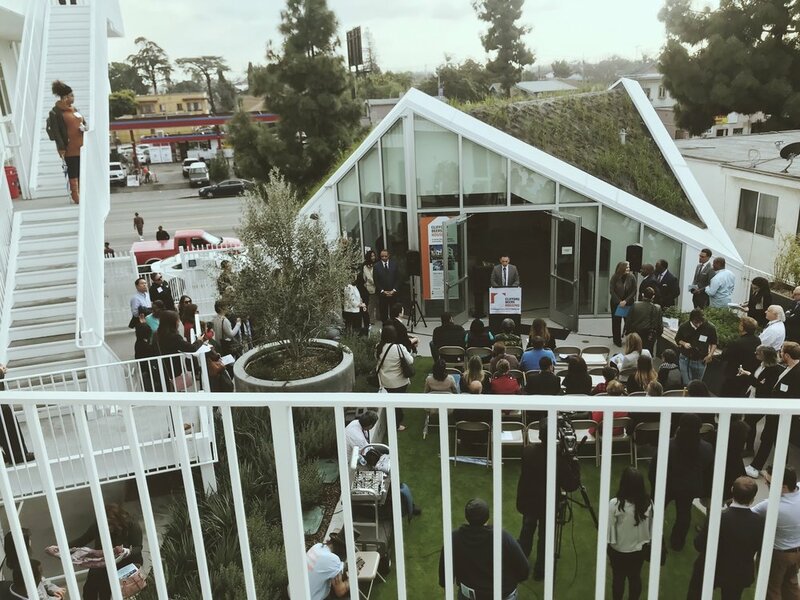 Located in South Los Angeles, Clifford Beers transformed a vacant lot into a four-story apartment community that provides affordable housing to 26 families and military veterans. The community proves that green building can be available to everyone. King 1101 is situated close to Exposition Park providing its residents with easy access to public transit, museums, and gardens. In partnership with The People Concern, the site provides numerous social services including mental health care, life skills workshops, and financial literacy training. King 1101 provides 15 units for chronically homeless households and large families with special needs and 10 units for homeless veteran households with rental rates less than 30%-50% of area median income. The community was designed by Lorcan O’Herlihy Architects. The California-contemporary design features outdoor green spaces and ventilation that decreases energy consumption. Other green features include solar water heating and electric vehicle charging. Assemblymember Reggie Jones, Clifford Beers Housing CEO Cristian Ahumada, LA City Councilman Marqueece Harris-Dawson and staffer for the Mayor Christina Miller make acknowledgements at the Grand Opening reception. Is your organization having a grand opening or groundbreaking? SCANPH is eager to spotlight all of our members’ achievements in affordable housing. Contact aoliver@scanph.org with details so we can better bring attention to the hard work of our membership.